The quick rise in prominence of the Idle No More movement, and the ongoing hunger strike by Attawapiskat Chief Theresa Spence represent a stunning opportunity for progressive change in relations between the Canadian Government and First Nations communities. We believe that opportunity should be seized upon. Over the last 72 hours we’ve been working day and night to help organizers from the Idle No More movement and their supporters get up and running on NationBuilder and provide help leveraging the toolset for an impressive campaign. 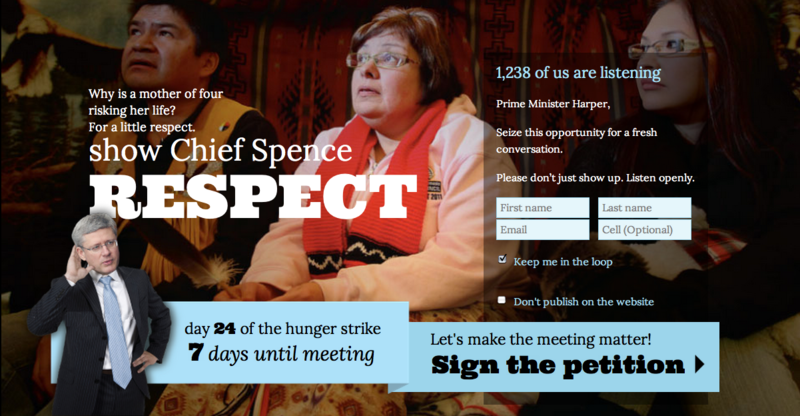 The campaign (Respect Chief Spence) calls on Canadian Prime Minister Stephen Harper to make the most of his recently scheduled meeting with First Nations leaders and the hunger-striking Chief Spence. This is one of those moments campaigns dream about, the opportunity to win transformative change through mass organizing and movement building. We’re thrilled to be contributing what we can to leverage the latest in digital campaign tech and strategies to win that change.